The Patch Springs Wildfire destroyed Johnson’s Pass landmark Willow Springs Lodge and some nearby trailers, and forced the evacuation of Willow Springs and nearby Terra Friday. After the fire raged through Willow Springs, a series of air tankers arrived and dropped retardant to prevent the fire from reaching Terra. Cheri Lefevre, owner of Willow Springs Lodge, recognizes some of the charred remains of what used to be her and her husband’s home. According to fire officials, the Patch Springs Wildfire has burned more than 31,000 acres and is 70 percent contained. Steve Snider of Terra explains how he and his family had to evacuate from their home late Friday afternoon as flames threatened the community. In the distance, smokes rises from the Johnson Pass area. Wildland firefighters used Rush Valley as their home base. The temporary Information Command Post was used for the Patch Springs Wildfire, which started Aug. 10 by lightening. On Monday, 377 personnel were working on the wildfire. After nearly a week of firefighters trying to slow the progress of a lightning-sparked wildfire in Skull Valley, flames leapt the highway and consumed homes near Johnson’s Pass. 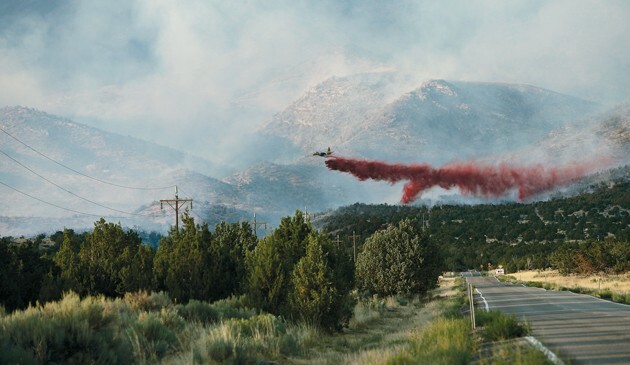 Though it had been held back for days along the western slopes of the Stansbury Mountains, the Patch Springs Wildfire swept through Willow Springs hot and fast Friday, snaking past a bulldozed firebreak and jumping SR-199. Among what remained, an ashy heap that once was a car was surrounded by cooled puddles of hubcap aluminum and glass, and towering power lines bowed low after being burnt in half. But the fire was also inconsistent — just feet away from the car’s melted glass is a partially intact garden hose, and some trees are nothing but bones on one side but full and green on the other. Interspersed with blackened and devoured camping trailers and prefabricated homes are five camping trailers that hardly show the least bit of scorching. Dave Cabrera lives in one of the surviving trailers. The charcoal trail of the fire leads right up to his front door, but his trailer was undamaged. He doesn’t know why, he said, but he’s happy all the same. 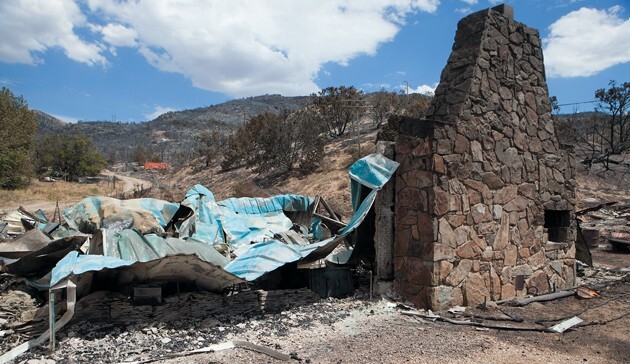 One thing the fire did not miss as it ravaged the hills was the Willow Springs Lodge. What had stood as a landmark for the better part of a century was reduced to rubble and debris still smoldering around the lodge’s stone fireplace. The owners of the lodge, Mike and Cheri Lefevre, surveyed the destruction Monday. Things could be a lot worse, they conceded — they were able to get some photographs and other cherished belongings out, and no one was hurt — but there is a lot that was taken, too. The residents of Willow Springs were first evacuated Thursday afternoon, but let back into their homes that night. Just a half hour later, however, they were told they needed to leave immediately. 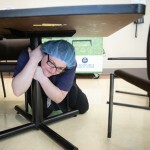 Terra was also evacuated Friday. Displaced residents were sent to the LDS chapel a few miles south of Terra, where highways 199 and 196 merge at the gates of Dugway Proving Ground. Some had brought along camping trailers and many remembered water and other necessities, but preparedness varied among residents. One man was in mid-repair of a truck when the evacuation order was issued, and finished the job from the church’s parking lot. For Steve and Rhonda Snider, evacuation is old hat, though not something they had planned to do when they moved to Terra five years ago. The family had moved from Florida, where the choice was between evacuating or battening down the hatches when hurricanes rolled in. Still, Steve Snider said, the evacuation came as somewhat of a surprise for the couple as they grabbed their two children, two dogs and two cats. “It kind of caught us off-guard a little bit. It had been holding so well and we haven’t had any smoke, and then all of the sudden, we had to go,” he said. Snider said he was not expecting to be allowed to go home right away, but even if the evacuation order was lifted, he knew there would probably still be some disruption to life from the fire. The last time one of the plagues hit Terra — a flood and mudslide in August 2010 along the burn scar of a 2009 wildfire — the power was out for about a week. Snider said he had fueled up a generator and filled water jugs in a camping trailer, just in case. Snider’s hunch was right. As if the threat of losing homes to fire was not enough for residents of the small community, the burnt power poles meant Rocky Mountain Power lines to the area were destroyed. Willow Springs, Terra, the chapel and Dugway Proving Ground all lost power. And because water in Skull Valley is pumped from wells, no power also meant no water. 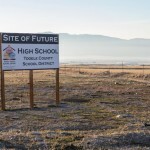 Dugway had generators, and water, but the church was dark and dry, prompting officials to move the shelter to Grantsville High School. 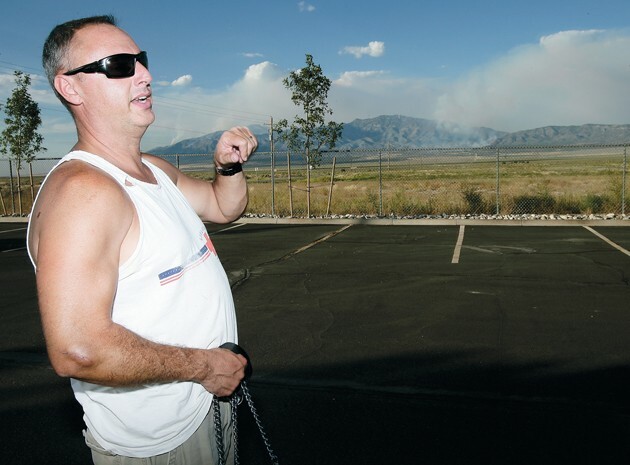 Residents were reluctant to travel more than 50 miles for a shelter, and most instead opted to stay with family and friends elsewhere or take advantage of Dugway’s offer of temporary shelter in the installation’s community center. Terra residents were allowed back in their homes after 10 p.m. Friday, though still without power. Johnson’s Pass, which had also been closed, was reopened at about 8 p.m. Sunday. The fire, sparked by a storm on Aug. 10, has to-date turned 31,000 acres from late-summer brown to charcoal black and ashen gray, and is currently at 45 percent containment. The blaze had been battled primarily by firefighters from the Bureau of Land Management, but local departments, including the Grantsville Volunteer Fire Department, North Tooele County Fire District, Rush Valley Fire Department, Terra Fire Department and crews from Dugway, also stepped in. On Saturday night, more crews rolled in as the Great Basin Type 2 Team took command of firefighting efforts. Denise Cobb, public information officer for the team, said the wildland firefighters were brought in after determinations were made that the fire was more complex than previously thought. “The type of support is based on the complexity of the fire,” she said. And that type determines what resources firefighters will get. With the type 2 designation — a step up from type 3 but still below type 1 — more firefighters and air support were brought in, creating a sort of tent city in Rush Valley. A total of 377 firefighters, including crews from Kentucky, Delaware, Nevada, Tennessee and Pennsylvania, were on the roster Monday. But Cobb said because of the level of containment that had been achieved, and because of the lack of growth since the weekend, some of those crews would likely be sent to help fight other fires. 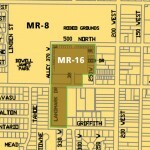 Some of the complexities in this case included the different types of land involved and the different rules on those lands. For example, Cobb said, the U.S. Forest Service typically prefers to avoid dropping fire retardant on their land, especially wilderness, for fear that the chemicals could disrupt the ecosystem. Other areas ask that a bulldozer not create a firebreak across their land, she said, leaving firefighters to dig a smaller trench instead. Cobb said fire retardant was dropped on some areas of the fire, and that a backburn had been made last week. Joanna Wilson, a spokeswoman for the BLM, said a backburn was performed in the area with hopes that it could stop the fire’s progress by preemptively consuming fuel. Such a practice is common for fires such as this, she said. Those hopes of keeping the wildfire from homes were dashed. Wilson said there are several possible reasons why the fire went through Willow Springs so savagely but ignored Terra, including geography and dumb luck. From a distance, the Lefevres had a good view of the direction the fire was going as it came to the place they had called home since 2005. That was when Cheri Lefevre took over the lodge. Mike Lefevre said he watched the fire’s progression through binoculars from the safety of the chapel. 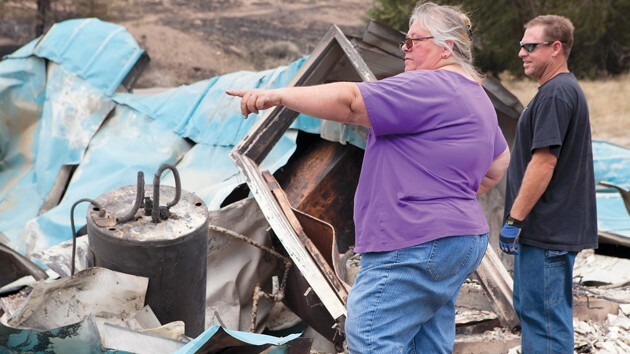 For Cheri Lefevre, the signal that the fire had reached their community came in steps. The pine tree had indeed been ravaged by the fire, and the lodge was completely destroyed. But the cabin, which the Lefevres said they had been mostly using for storage as they lived in the lodge, was virtually untouched, still surrounded by green grass and shaded by surviving trees.